Without a mechanism to ensure equality of access in all Boston communities, it's inevitable that wealthier communities will have access to the good schools. Massachusetts' governor Deval Patrick warned last week of state budget cuts and significant increases in transportation fees if lawmakers are unwilling to accept tax hikes. Secretary of Administration and Finance Glen Shor said legislators' current plan may prompt the need for $783 million in cuts to non-transportation programs, including $362 million in new education initiatives. Like most states, Massachusetts has been struggling to balance its budget, and in the process, officials have been making huge cuts to public programs. In December 2012, Governor Patrick ordered spending cuts across state government to close a projected $540 million budget hole that included chopping $9 million in local aid to cities and towns. Local officials have been scrambling to find programs to cut and outsource on the cheap. 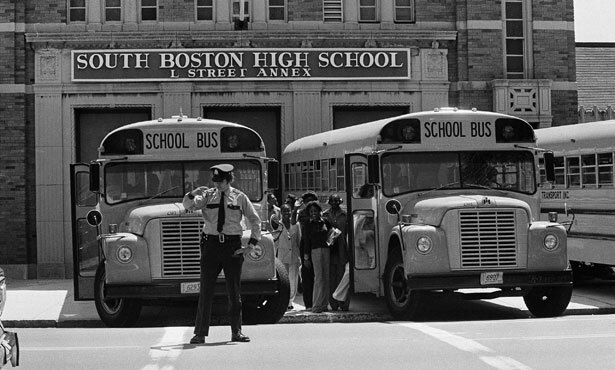 In March of this year, the Boston School Committee threw out the last remnants of a busing system first imposed in 1974 under a federal court desegregation order. The idea is this: instead of busing kids across town to achieve integration, the committee believes students will attend schools closer to home. Mayor Thomas Menino appointed a special advisory group in 2012 to overhaul the system that many call wasteful and expensive. Transportation alone costs the city $80.4 million a year—about 9.4 percent of the school system's operating budget, almost twice the national average. Furthermore, the old bus system sometimes resulted in weird districting where children who live on the same block ended up going to different schools. There have also been complaints of inefficient bus routes that result in children arriving nearly an hour late to school in some cases. The four bus yards were managed by First Student Inc., but authorities have acknowledged that the blame for the late arrivals is not confined to the contractor, and changes involving transportation options for special needs students, closing and merging campuses and consolidating more than 1,500 routes have affected route times. Computer software used by the department has also been blamed for underestimating the time it takes to drive from the bus yard and to pickup stops and schools. Drivers are harshly punished for being late, and can sometimes lose up to a day's pay if they are more than five minutes late to work. Last month, school officials announced they are planning to recommend a new transportation company to oversee daily operations of the city's more than 700 buses. The recommendation called for awarding a five-year contract to Veolia Transportation Inc. School officials declined to disclose the cost of the proposed contract, but they claim the bid came in $6 million less than anticipated. The Harvard Crimson applauded Menino's support of axing the old busing system. "We encourage the new mayor to use the neighbourhood school system—and the budget savings that ending busing has created—to focus on improving access to quality public education for all of the city's residents," the Crimson declared. But the concern among many Boston residents, some of who lived through segregation and the introduction of the old busing system, is that switching to neighborhood schools will worsen the city's class segregated school system where wealthy kids from wealthy communities go to well-funded schools, and poor kids are stuck with underfunded schools in poverty-stricken neighborhoods. Worse, because of budget cuts and school closings, more and more poor kids will be forced into fewer and fewer neighborhood schools that are always having their funding cut by the state. And as the schools continue to close, the bus routes will undeniably grow longer for some children. It seems as though the problem is less a question of complicated bus routes and more that schools continue to close, forcing children to commute longer to the next yet-to-be-closed facility. Parents were successful in stripping a "walk-zone priority" from the new deal, which reserves half the seats in each school for students who live within a mile. The problem with this component is that it is perceived to benefit those who live near good schools, i.e., wealthy families, since oftentimes a good school means high real estate values. Nationally, we've already seen the effects of school closings, and it's clear the first victims of austerity are always poor people of color. The Chicago Public Schools' plan involves closing 53 schools and 61 buildings, mostly in black neighborhoods. Many in Chicago have called the closing scheme racist since it disproportionately affects people of color. The outcry was so loud that Schools Chief Barbara Byrd-Bennett was forced to respond specifically to the accusations of racism, saying that while she understands the proposals have caused communities anguish, "change is inevitable" and she "will not accept…the proposals I am offering are racist." Institutional racism doesn't necessarily require its individual players be foaming-at-the-mouth racists. These players need only obey the numbers, and if balancing the budget requires lowering the hammer on people of color, well… change is inevitable. The Associated Press spoke with Ginnette Powell, who endured the battle over desegregation in Boston in the 1970s. Tears come to her eyes when she talks about how it took her decades to return to the place where she never felt safe as an African-American seventh-grader. "It was scary because of what you were going into, getting bricks thrown at your bus. I remember the bus windows being broken," said Powell, now 48. Elaine Ng, executive director of the Boston Chinatown Neighborhood Center, told the AP, "I think that we can't move forward, looking at how to improve our schools and access to our schools without looking at how the past impacted the present." As the daughter of Chinese immigrants, Ng learned to speak English as a kindergarten student in a Boston public school. But after her family moved from Chinatown to a white neighborhood in 1976, students threw stones at her when she walked to school. Ng said one of her frustrations is that people don't recognize all the ripple effects busing had. "It didn't matter whether or not you were on a bus," she said. "Racial tensions in the city were just really high." It really wasn't that long ago—really, the blink of an eye in terms of our collective historical timeline—when school integration was met with vicious resistance. The uproar started in 1974, when a federal judge imposed busing after a lawsuit claimed black students were getting lower-quality education than children who attended mostly white schools. Black students were bused to schools in white areas, and white students went to black neighborhoods. The National Guard was called in amid demonstrations and riots; school buses got police escorts. The unrest continued for years. In 1976, a news photographer caught a white teenager attempting to spear a black man with an American flag during a busing protest outside City Hall. In 1979, 15-year-old black football player Darryl Williams was left paralyzed by a white sniper's bullet during a high school game. Numerous parents and activists have complained about the termination of the busing integration system. “No way we can stand around the playground and say, ‘Yeah, we’re all getting a fair shake,’“ one father testified. Dropping desegregation busing and switching to a neighborhood schooling system will inevitably lead to segregated access. Unless there is a mechanism in place to ensure equality of access in all Boston communities—and we already know there's not—it is inevitable that wealthier communities will have access to the good schools, while the poor majority will be left to cram inside the handful of schools that manage to survive the age of austerity. At Indiana University, austerity and race go hand-in-hand. Read StudentNation's primer on this week's campus-wide strike.